Skype is very popular software today to do videos calls and chat with your friends and family. The best part of Skype is that it is available for mostly all operating systems. Millions of people are using Skype for business or personal use today. There is no charge in using Skype for any purpose. But while doing video calls with your friends and family, sometimes you probably need to record these calls. There is not any option available in Skype directly to record calls for free. So for the same reason, we are going to tell you all ways to record Skype calls for free today. It has been considered as one of the best Skype video/audio call recorders. It allows to record screen as well as Skype calls recorder and have a build in player to play the recorded video. For more than 10,000+ sites, videos can be downloaded through iTube Studio. It has many other cool features, such as batch downloader, convert files from one format to another etc. It allows users to record Skype. Build in player to play recorded and downloaded videos. 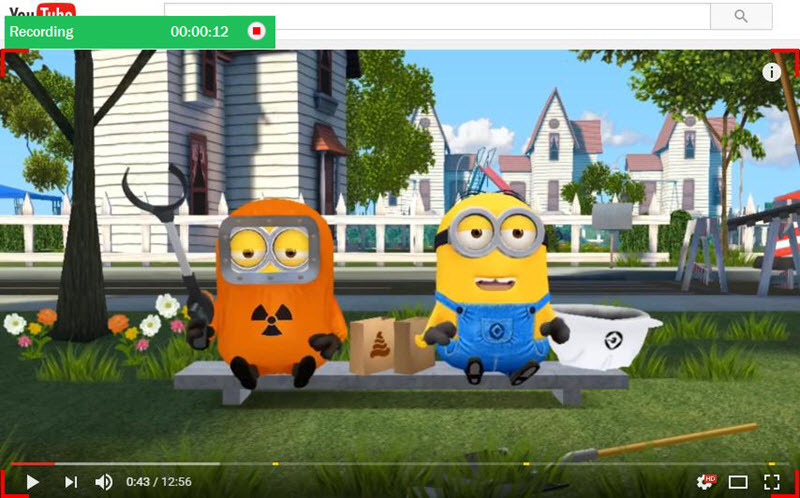 Simple click enables you download an entire video. HD Quality of the video is maintained throughout. At a single time, bulk download can be done from several channels. Conversion is done to almost every format. Device compatibility is ensured in the process. The download is done in 3X speed. Transfer video/music to mobile devices. Step 1 Download iTube Studio from the above given download link, install and launch it. Step 2 Click Record > Record button on the main interface of iTube Studio, and it will become standby status with a record rectangle tool shown. Go to your Skype, and adjust the size of the record tool if necesary and then prepare to make a Skype call. Step 3 Click the REC button at the upper-left corner as soon as you start making the call. If you want to end the record, go to click Stop button. Alternatively, you can set the end time by checking Stop at and then setting the end time. Step 4 Once your recording is complete, you can find the recorded Skype calls in Finished library. Now you can enjoy your call recording with the built in player of iTube Studio. 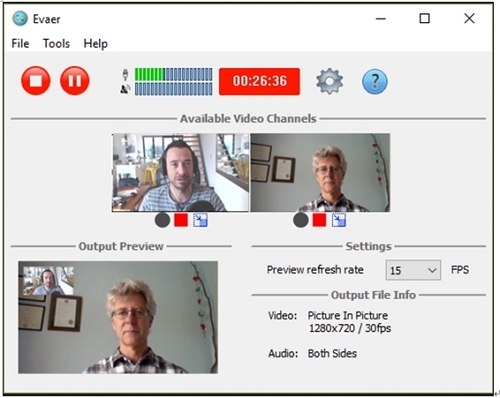 Evaer Skype Video Recorder software enables users to record Skype audio and video calls into mp4/ AVI movies. This software is very easy to use and allows you to record conferences, podcasts and family VoIP calls for free in the trial version. This software is able to record Skype calls easily and quickly. This Skype video recorder supports high quality up to 720p resolution videos to record. There is a great function available in this software that is that it allows users to share screen as well. Record Skype videos and audio calls into mp4 and AVI movies format. Enables you to record Skype videos calls up to 720p resolutions easily. Screen sharing feature is there to share screen of computer as well. Automatic chat replies when you are away from your computer. Record Skype calls and a great feature that is screen sharing option. Record conference and VoIP calls as well. Only recording is possible, download is not possible with this software. Very less video formats compare with iTube Studio. Free Video Call Recorder for Skype is available from the DVDVideoSoft company and enables you to record Skype video calls and with perfect video and audio quality. 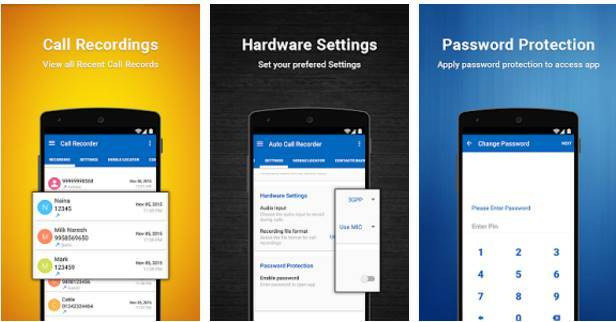 There is no limitation on recording calls using this software. There is an option available to pause videos while recoridng if you want to skip something from recoridng. 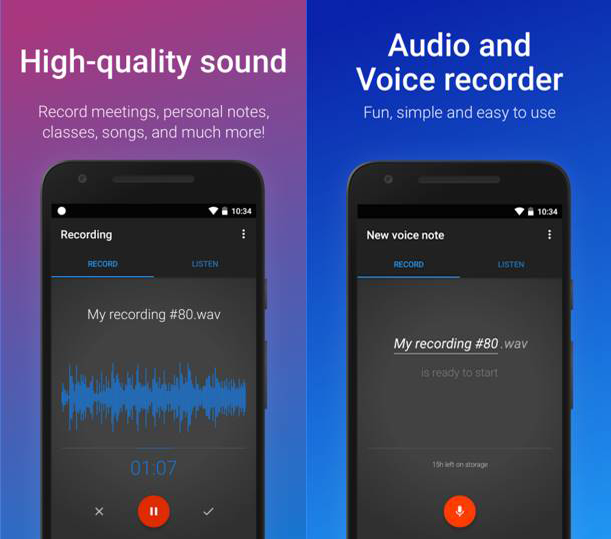 Record Skype videos calls with perfect audio quality. There is no need to install any extra libraries to use the program. Record videos from Internet directly. Pause recording option is there. 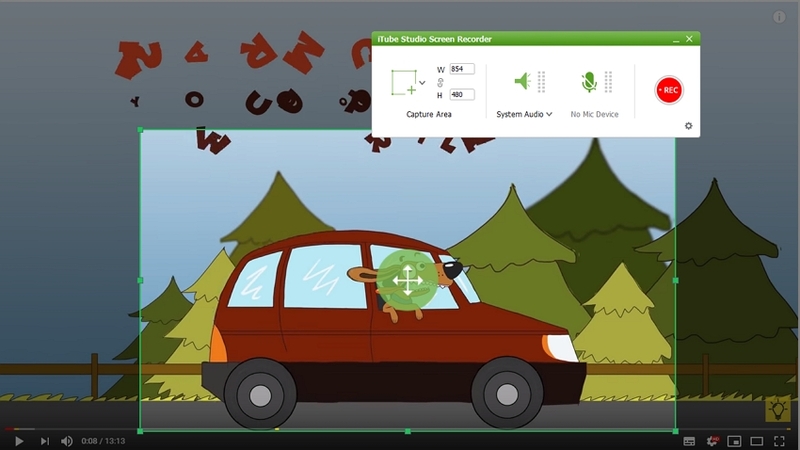 Internet videos as also recorded by this software just like iTube Studio. Not able to download videos in good quality. Only a few online video sites are supported. 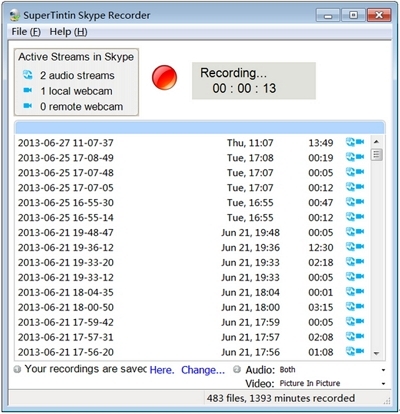 Supertintin Skype recorder finally allows you to record audio and videos Skype calls easily. This software can be a good choice for the users to record online interviews, lessons, or family VoIP calls easily. This software allows users to record Skype video calls by picture in picture and side by side. This software is available for Windows users to record Skype calls on Windows devices. 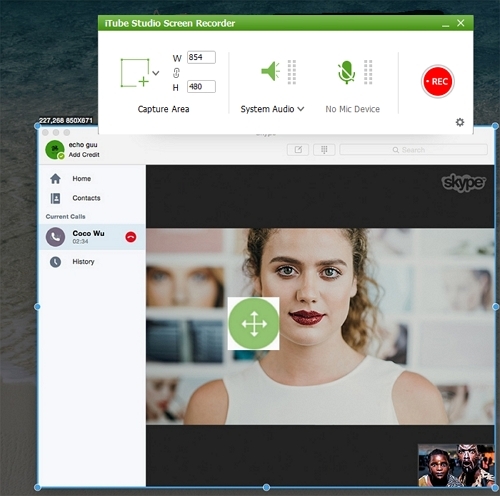 Record Skype picture in picture, remote only and side by side video calls. Record Skype video calls remotely as well. 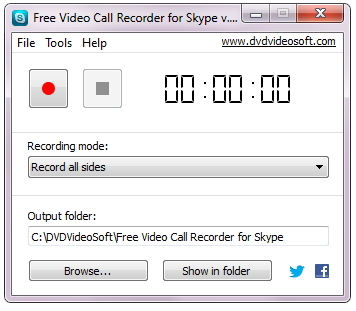 Record Skype calls in HD formats. 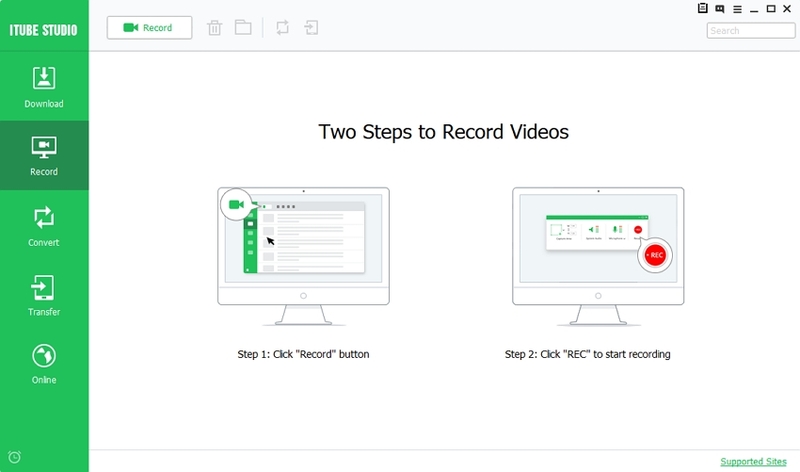 Enables users to record conferences, online interviews and lessons as well. Record online lessons and interviews as well. Only recording function is there. Users can’t convert recorded videos to other formats. Hot Recorder is a VoIP based tool that lets you record Skype conversations automatically online. It works with Skype 3.0, Google Talk, AIM, Net2Phone, Yahoo Messenger, Firefly and many other VoIP applications. Skype recordings or any other recordings can be converted into MP3, WAV or OGGfiles. The tool also allows you to add humorous sounds to your online conversations via emotisounds. The trial version of Hot Recorder for VoIP is limited to two minutes of recording. 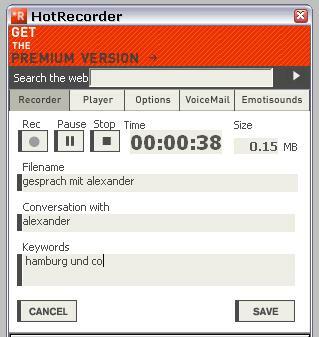 Full version of Hot Recorder is available for $14.95USD. Converts recordings into three audio formats. It is very handy and User friendly. No user support is provided.